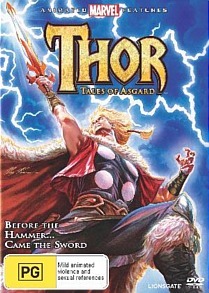 Thor: Tales of Asgard DVD Review. It won’t stay in your memory forever, but it is an interesting take on an old and beloved Marvel character that we haven’t seen before. Treat it as an appetizer to the live-action movie and you can’t go wrong. This is Thor portrayed in a time before he was a hero. It’s set in the Marvel universe, but there’s no sign of Donald Blake or the mythical hammer Mjolnir. Odin doesn’t have his eye patch and Loki isn’t evil- yet. When we first meet him in Tales of Asgard, Thor is an impertinent youth whose fighting skills haven’t quite caught up to his mouth or his ego. He dreams of testing himself in a true adventure, but he has been confined to the realm of Asgard by his father, Odin. He and his brother Loki stow away aboard a ship bound for one of the outer realms, where Thor’s cocky nature quickly gets them into trouble. The two barely escape, with the help of their friends Fandral, Hogun and Volstagg. But rather than learn from this debacle, Thor leads them into greater danger- to Jotunheim, land of the deadly Frost Giants. Thor acquires a mystical sword of immense power, but, underestimating its capabilities, he accidentally kills two giants and provokes a war between Jotunheim and Asgard. There are plenty of big action scenes and dramatic moments in Asgard, and they all look good. The movie has a not-quite-anime style to it, and is presented as a mixture of CGI and traditional hand-drawn animation. The visuals are bright and colourful in a Saturday morning cartoon kind of way. The soundtrack is suitably climactic in all the right moments, and the voice acting is workable, if not outstanding. Veteran film and video game voice actor Matt Wolf is the standout, as Thor himself. As a long-time fan of the comics, I found I wanted more from some of these characters. Odin the All-Father comes across as a muscle-bound Father Christmas- during the exchanges with the young Thor I found myself wishing he’d send the whelp to his room on the end of a thunderbolt. Thankfully some of the other characters are more interesting. Charm and humour are provided by the Warriors Three, while Loki acts as Thor’s conscience throughout the journey. Along with two sets of commentary, the DVD contains a lengthy ‘making-of’ featurette. Watching this, it’s obvious the love the production team have of their source material. This featurette covers everything from the design of the title sequence to the soundtrack to the characters themselves. Also included is an episode of ’The Avengers- Earth’s greatest heroes,’ which pit’s the Thunder God against some earthly super villains. It won’t stay in your memory forever, but it is an interesting take on an old and beloved Marvel character that we haven’t seen before. Treat it as an appetizer to the live-action movie and you can’t go wrong.